Bill is retired from the Williamsburg-James City County Schools where he served for 31 years as a teacher and the K-12 Science and Mathematics Curriculum Coordinator. He joined CCB as Education Director where he develops curriculums and conducts school presentations and teacher workshops. 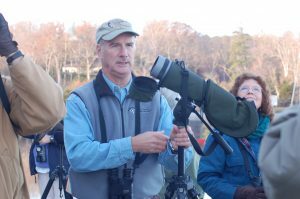 Bill is also active is waterbird and shorebird surveys in coastal Virginia. Watts, B. D., M. D. Wilson, F. M. Smith, B. J. Paxton, and J. B. Williams. 2008. Breeding range expansion of the Coastal Plain Swamp Sparrow. The Wilson Journal of Ornithology 120:393-395. Brinker, D. F., B. Williams, B. D. Watts, and R. M. Erwin. 2007. Colonial-nesting seabirds in the Chesapeake Bay region: where have we been and where are we going? Waterbirds 30:93-104. Williams, B., D. F. Brinker, B. D. Watts, and R. M. Erwin. 2007. The status of colonial nesting wading bird populations within the Chesapeake Bay and coastal barrier island-lagoon system. Waterbirds 30:82-92. Williams, B., B. D. Watts, and M. A. Byrd. 2006. A census of a Cliff Swallow colony on the Benjamin Harrison Bridge. The Raven 77:35-40. Williams, B. 2005. The 30th annual beach-nesting and colonial waterbirds survey of the Virginia barrier islands-2004. The Raven 76:14-20. Williams, B., B. D. Watts, and M. A. Byrd. 2005. A 2005 cliff swallow census of the Benjamin Harrison Bridge. The Raven 76:40606. Williams, J. W. and B. J. Paxton. 2004. The Spring 2004 Capes Charles, Virginia Seabird Watch. CCBTR-04-17. Center for Conservation Biology Technical Report Series. College of William and Mary, Williamsburg, VA. 18 pp. Williams, J. W. and B. J. Paxton. 2004. Cape Charles Seabird Watch, Fall 2003. CCBTR-04-16. Center for Conservation Biology Technical Report Series. College of William and Mary, Williamsburg, VA. 19 pp. Williams, B., B. Akers, M. Beck, R. Beck, and J. Via. 2004. The 2003 Beach-nesting and colonial waterbirds survey of the Virginia barrier islands. The Raven 75:61-66. Williams, J. B.J. R. F. Lukei Jr., and M. A. Byrd. 2003. Trapping and banding of raptors on the Eastern Shore of Virginia National Wildlife Refuge: Year 2002 Report. CCBTR-03-04. Center for Conservation Biology Technical Report Series. College of William and Mary, Williamsburg, VA. 13 pp. Williams, B., B. Akers, M. Beck, R. Beck, and J. Via. 2003. A summary of the 2002 beach-nesting and colonial waterbirds survey of the Virginia barrier islands. The Raven 74:53-57. Williams, B., B. Akers, M. Beck, R. Beck, and J. Via. 2002. A summary of the 2001 Virginia barrier islands beach-nesting and colonial waterbirds survey. The Raven 73:10-16.